Kabul (RFE/RL) – More than 400,000 undocumented Afghan migrants left Iran for Afghanistan so far in 2018, many of them in buses from Herat, near the Iranian border, to Kabul. Mohammad moved back to his native Kabul after living more than 10 years in Iran, where he washed cars and worked in construction to earn money to send back to his family of eight in Afghanistan. Mohammad is among the hundreds of thousands of Afghan migrants who once flocked to Iran for work but who have returned to their war-torn homeland amid a crippling economic crisis. 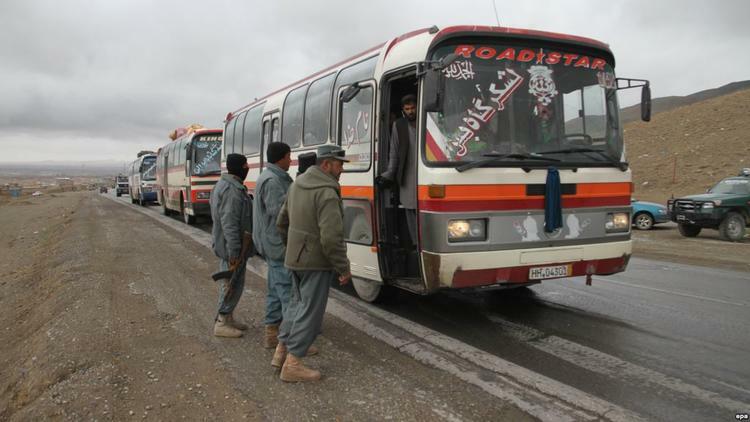 It is unclear if the returnees plan to stay in Afghanistan temporarily or for the long-term. Iran’s economic turmoil, which has sent unemployment soaring and the national currency plummeting — has hit Afghan migrants particularly hard. The demand for work in the gray economy, where most Afghans work, has declined sharply. Iran’s currency, the rial, has weakened against the afghani and is at record lows against the U.S. dollar, which is widely used in Afghanistan. It’s better here than in Iran. Even if I earn [$4 per day], it’s still more than I would make in Iran. I don’t think many Afghans will stay in Iran.” — Sediqullah, an Afghan man who has returned from Iran. More than 400,000 undocumented Afghan migrants left Iran in 2018, according to the International Organization for Migration (IOM) — a massive increase from 2017, when 187,000 returned over the course of the entire year. The mass exodus has been “largely driven by recent political and economic issues in Iran, including massive currency devaluation,” according to the IOM’s July report. The dire state of Afghanistan’s economic and security situation underlines the extent of Iran’s economic woes. The war-torn country that Afghans are returning to suffers from around 40 percent unemployment, is heavily dependent on dwindling foreign aid, and is in the midst of the worst drought in decades. Humanitarian groups say the returnees, should they stay, could exacerbate the problems Afghanistan is facing. Yet for Mohammad and many others, Afghanistan still represents an improvement. Among them was Sediqullah, who spoke to RFE/RL’s Radio Free Afghanistan after getting off a bus at Kabul’s main bus terminal. Wearing a traditional piran-tumban and a checkered scarf, the 32-year-old says he lived for several years in the Iranian city of Zahedan, near the Afghan border, and found work in construction. On January 1, a U.S. dollar was worth 42,900 rials. On July 31, the rial traded at a record low of 119,000 to the dollar. 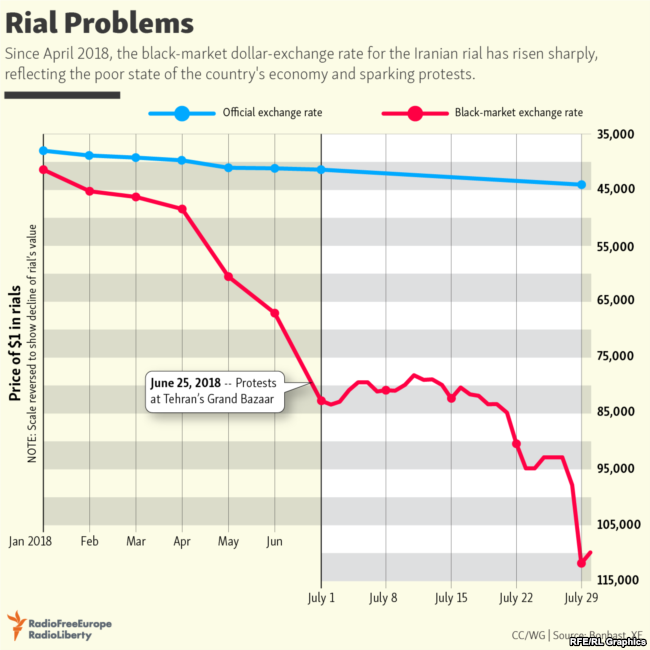 The plummeting value of the rial has coincided with U.S. President Donald Trump’s decision in May to withdraw from the 2015 nuclear deal between Iran and world powers. Washington is reimposing sanctions on Tehran in two stages, in August and November. Economists say U.S. sanctions will severely affect Iran’s ability to conduct trade and restrict access to finances and foreign investment. It will also adversely affect Iran’s ability to sell oil, Tehran’s most lucrative export. In April, Iran fixed the rial at 42,000 to the U.S. dollar, but black-market rates skyrocketed as Iranians rushed to illegal traders, seeking to protect their savings by buying dollars. In June, the government softened its stance after many banks refused to sell dollars at the artificially low rate. The currency crisis has resulted in a spike in unemployment and in the cost of everyday goods. The downturn in Iran has particularly affected the estimated 1 million registered Afghan refugees and the estimated 1.5 million to 2 million undocumented Afghans living there. But its effects could be even more far-reaching. “Afghans [in Iran] typically send home the main parts of their earnings in the form of monthly remittances. The Afghan economy itself will suffer direct and immediate effects. Less money coming from working males who are instead returning home to few jobs, combined with an ongoing drought and resource competition with other returnees, will mean a significant decline in the economy,” says the IOM’s Bishop. For decades, Afghans have turned to Iran to earn a living, despite widespread reports of migrants facing violence and injustice there. Many of them moved to Iran following the Soviet occupation of Afghanistan and the civil war that followed the Soviet withdrawal. Others sought refuge in Iran after the Taliban took power in Afghanistan. Many have taken on menial work that is of little interest to Iranians. Frud Bezhan covers Afghanistan and the broader South Asia and Middle East region. Featured Photo courtesy RFE/RL: More than 400,000 undocumented Afghan migrants left Iran for Afghanistan so far in 2018, many of them in buses from Herat, near the Iranian border, to Kabul. (illustrative photo).